Why Extended-Range VLANs are not supported or transported by VTP Ver 1 and 2? Normal-Range and Extended-Range VLANs Normal-range VLANs are VLANs 1–1005, and can be advertised via VTP versions 1 and 2. These VLANs can be configured in VLAN database mode, with the details being stored in the vlan.dat file in Flash. Extended-range VLANs range from 1006–4094, inclusive. 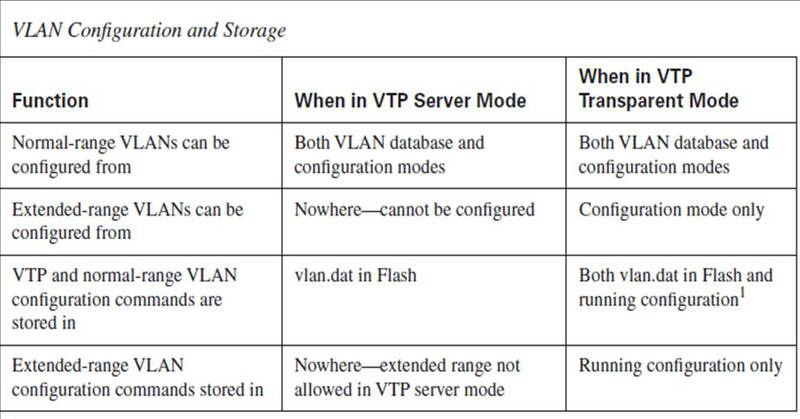 However, these additional VLANs cannot be configured in VLAN database mode, nor stored in the vlan.dat file, nor advertised via VTP. They can only be configured when the switch is in VTP transparent mode. of the 15 bits reserved in the ISL header to identify the VLAN ID. These 10 bits makes the combinations of only 1024 Vlans, thus supporting only 1024 Normal Range-VLANs. The later-defined 802.1Q used a 12-bit VLAN ID field, thereby allowing support of the extended range. Following that, Cisco changed ISL to use 12 of its reserved 15 bits in the VLAN ID field, thereby supporting the extended range. Catalyst IOS stores VLAN and VTP configuration in one of two places—either in a Flash file called vlan.dat or in the running configuration. IOS chooses the storage location in part based on the VTP mode, and in part based on whether the VLANs are normal range VLANs or extended-range VLANs. VTP3 expands and enhances the concept of the server role. The default server role will be the secondary server subtype. In addition, only one server per domain can be prompted to be a primary server. Client and secondary server devices receive a configuration from a primary server. A secondary server stores the received configuration in a local permanent storage space (for example, NVRAM) and updates other devices in the same domain and for the same instance.